This is the 5th and last post of Skin pH series: Read the 1st post on Understanding Skin pH and its Impact here, 2nd post on Overly Acidic and Alkaline Skin here, 3rd post on Diet, Environment on Skin here and 4th post on Moisturizing and Skincare Products’ impact on Skin and Skin pH here. 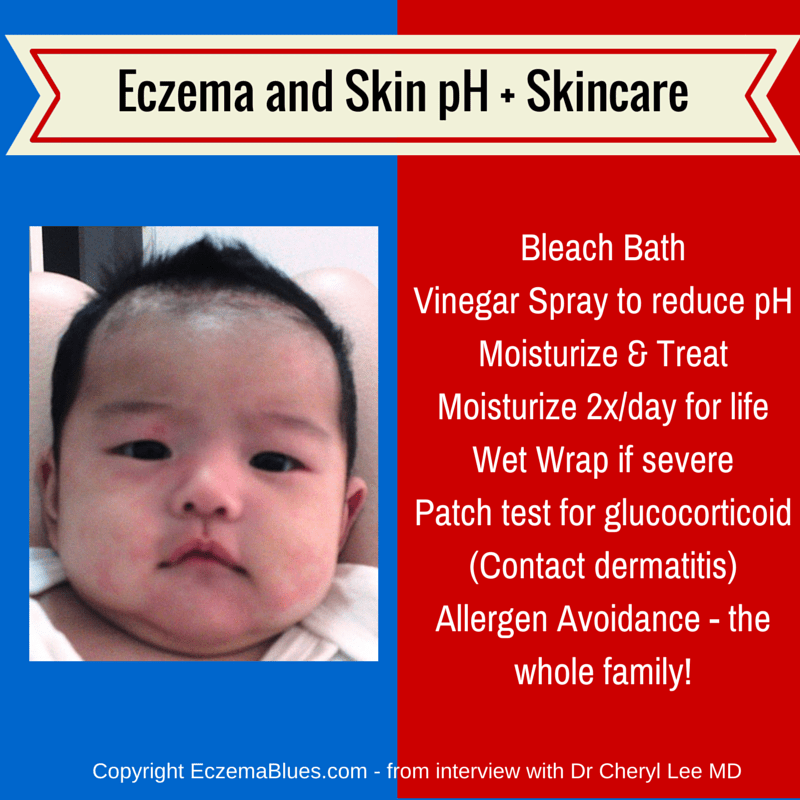 MarcieMom: Thank you Dr Cheryl Lee for being with us for the past 4 weeks and today, we focus on eczema skin – a topic which parents/readers of this blog would most certainly be keen to find out! MarcieMom: I read that alkaline pH is associated with skin dryness. Since eczema is characterized by skin dryness, does this mean all eczema skin is too alkaline? Came across a study that even the uninvolved skin of eczema adults have higher alkaline pH than those without eczema. It was stated as 6.13±0.52 on the eczema lesions, 5.80±0.41 on perilesional skin and 5.54±0.49 on uninvolved skin. In the control group, the mean pH of the skin surface was 5.24±0.40. Skin lipid deficiencies (phytosphingosine, phytosphingosine-containing ceramides like Ceramide 3, cholesterol esters, and very long chain fatty acids have been shown to be particularly deficient in atopic skin, dry skin and aged skin). Excessive loss of water due to skin lipid deficiencies. (white petrolatum in the gold standard water loss inhibitor. Paraffin is likely even more effective than petrolatum however. Certain lipids have also been shown to be very good at inhibiting water loss. The lipid isostearyl isostearate is one of the most effective lipids as preventing water loss from the skin. Susceptibility to infection (caused by the lipid deficiencies—some of these lipids are anti-staphylococcal—and caused by the overly alkaline pH). These 7 problems are present in the entire skin barrier of an atopic and this is why is it so very important to focus on skin barrier optimization that addresses all 7 of these problems simultaneously. MarcieMom: What skincare measures (if any) should parents of eczema children take to help the child’s skin to reduce its alkalinity? As I discussed in this post, I think bleach baths work as part of the eczema skin care regimen, but they also alkalinize the skin a little bit too. The target concentration of a bleach bath is .005% hypochlorite ion. Because there are different sizes of bathtubs around the world, it is difficult to just tell you how much bleach to put it. In the United States, we have a standard-sized tub that most people have in their homes. (And we have ridiculously large tubs too). For the regular-sized American tub, I recommend 1/8 cup if the tub is 1/4 full, or 1/4 cup is the tub is 1/2 full or 3/8cup is the tup is 3/4 full. For very mild cases of eczema, bleach baths may not be needed, but if there is any crusting or scabbing, try taking the bath three times a week. The more severe it is, the more frequently you should take a bleach bath. Special Trick for Babies with eczema: If your child will not stay in the bathtub long enough to have an effective bleach bath (about 20 minutes), then try using a large tupperware/plastic container INSIDE your shower for your child to play in. I recently discovered this on my own children and now I can’t get them to STOP taking a bath (which is bad for eczema too; too many baths can dry out the skin and make it worse). Of note, we have always thought that the bleach bath is working because it is killing the Staph. aureus on the skin. Well, recent studies showed that it is not only the killing of the Staph, but it is also due to the low level oxidation exposure. When the skin is exposed to very low levels of oxidation, the skin then turns on anti-inflammatory and reparative pathways. This is totally counter-intuitive, but is very, very interesting and makes me thing that our creator really knew what he was doing! After taking a bleach bath, use a pH-protecting gel with vinegar in it or use a vinegar spray diluted with one part vinegar and six parts water to all affected areas. (white vinegar or apple cider is best—no rice or balsamic vinegar). This should then be covered with a pH-optimized moisturizer (pH 4.6 to 5.6….a little more acidic may be beneficial, but more alkaline is bad). Of note, I had a patient come to see me all the way from Cambodia. When she went home to Cambodia, she was unable to find bleach anywhere. If this is the case, I have seen similar benefits from vinegar baths (it takes A LOT of vinegar–around 6 cups to a half-full regular American-sized tub). Or, you can do the vinegar spray or pH-protecting vinegar gel if you cannot take a bath. I think it is very important to moisturize atopic skin at least twice a day WHEN IT IS NORMAL LOOKING. When it is broken out AT ALL, I always advise that my patients use their eczema products (we use the TrueLipids Eczema Experts 1% Hydrocortisone Cream followed by the TrueLipids Relieve & Protect Ointment) up to four times a day UNTIL the skin is normal looking. Once the skin LOOKS and FEELS normal, then my patients switch to the TrueLipids Ceramide+ Cream followed by the ointment twice a day for maintenance. It is very important to treat ALL affected areas and not just the areas that are scabby looking. What I mean by this is that even the areas of the body like the stomach and back that may look a lot better that the worst areas on the arms and legs, must also be treated until they ARE normal; normal looking and normal feeling. The skin on the trunk often has what we call folliculocentric atopic dermatitis where each little hair follicle is more accentuated and is a little bit lighter in color than the skin around it. This is active disease and needs to be treated just as much as the scabby, inflamed areas do. The skin on the trunk usually heals much more quickly than does the skin on the arms and legs and, as it heals and goes to normal, the hydrocortisone can be replaced with the Ceramide+ Cream. I cannot stress the importance of maintenance moisturization. Plan on at least twice daily moisturization for the rest of your life. You must avoid all common allergens in your skin care products too. There are certain allergenic chemicals that are known to be more common in people who have atopic dermatitis and you should at the very least avoid them. I will write more about this in a later post. By optimizing the skin barrier, you can prevent it from breaking down into eczema and can probably also control other allergic diseases like asthma and hay fever too. If your eczema is very, very severe, you will need to do wet wrap therapy where you take your bleach bath, then do your pH adjustment and then wrap the skin in WHITE COTTON (not wrinkle-free type fabric because is often has formaldehyde in it) pajamas or bandages every day. I have even had a few patients who have needed to do wet wraps during the day too. Don’t use ACE wraps or anything that has latex or spandex in it as this can be allergenic for atopic skin too. Once the wraps or pajamas are on, spray them down with water and cover with a layer of dry clothing and go to bed. Also very important is that of glucocorticoid allergy. Studies have shown that between 24 and 90% of children with atopic dermatitis who are patch tested are allergic to at least one glucocorticoid. If your child is one who seems to either not get better with hydrocortisone or who gets a little better but then seems to get worse, he/she may be allergic to it. It is always a good idea in this case to get your child patch tested to see what they are allergic too and to learn what classes of gluccocorticoids that your child can use. I cannot stress enough how important it is so avoid allergens in your skin care products, soaps, detergents AND in the products that family members are using. Find a dermatologist who is experienced in patch testing (not prick testing) for allergic contact dermatitis (ACD). ACD is an allergy to a chemical that is coming in contact with the skin. For example, fragrance allergy is one of the most common allergens in atopic dermatitis. If daddy is wearing cologne and baby touches his shirt, this can equal a month of eczema flare for baby. The whole family needs to avoid the allergen triggers. In addition to fragrance (which cross reacts with essential oils and many plant extracts), common allergens in atopic dermatitis include nickel, formaldehyde releasing preservatives, propolis (in beeswax), neomycin, bacitracin and more. Thank you Dr Cheryl Lee for going through with us the factors that affect skin pH with practical steps on what parents can do. It will definitely help parents to be committed to these measures with the right understanding of why to take them. Thank you once again!